EVO is around the corner! On August 3rd in Las Vegas, Kamehamehas will be thrown. Just inputs will be pressed. Someone will have frame advantage over someone else. If all of that sounded like gibberish, good news! This article is tailor-made for you. The fighting game community has a reputation for being rather insular, and as a result they don't always explain many of the unique terms used in commentating. Here’s a handy list (with visual aids) to help you follow the action come August. We’ll start with some basic concepts and build from there. Note - the Fighting Game Community's lingo changes regularly. If you happened upon this article in 2020, I expect half this list to be outdated. Also I'm thrilled to know the FCG is still going strong during our nuclear winter. The pros crunch frame data to know their characters inside and out. These are frames where your character is preparing a swing, but the attack isn’t out yet. If you are hit during this part of the animation, your attack gets stuffed. These are frames where your character's limb, projectile, or weapon are out and will cause damage (or blockstun) if they connect. During these frames your character is returning to their neutral position. Their hand is coming back, or the leg returning to the ground. It’s during these frames your character is at their most vulnerable. As a general rule, light attacks have few total frames, heavy attacks have lots. We’ll discuss frame data again with other moves down the list, but this rudimentary explanation will serve well enough for the purposes of this article. If this stuff fascinates you and you'd like to know more, This 2012 article from In Third Person - where I got the handy picture at the top - breaks down frame data further. I also recommend the YouTube channel Core-A Gaming, which covers these concepts in greater detail. When you successfully land a hit, it applies something called "hitstun.” If you follow up with another attack while your opponent is still suffering from hitstun, you have now successfully executed a simple two-hit combo. Well done! Managing hitstun is key to executing lengthy combos. Once your foe’s hitstun runs out, they’re now able to act again. In Street Fighter V, attacks are broken down into light, medium, or heavy strength. A "Crush Counter,” which occurs when you land a hit with a stronger button than your opponent’s, applies additional damage and hitstun. This makes it easier to land big-damage combos like the one above. Blockstun is the same concept except your opponent is, as the name suggests, blocking. By stringing together a series of attacks, you can keep your opponent locked down for a blockstun combo. Inevitably though, if your foe keeps blocking they will eventually find an opening. A planned series of attacks against a blocking opponent is called a “blockstring.” While throwing out these attacks, you are looking for an opening, or hoping your opponent goes for an unsafe challenge. Ideally the end of a blockstring puts you in a safe position. If you’re right up in their face when the blockstring ends, you’re gonna get punched and it'll be their turn to lay on the hurt. Goku Black’s blockstring here pushes away on the last hit, moving him out of range of an easy counterattack. Ever play Street Fighter and get caught by a wake-up Shoryuken, a.k.a. the “Dragon Punch?” Then ya got wake-up DP’ed. Don't worry, it happens to all of us. Consider it a rite of passage for all Street Fighter players. 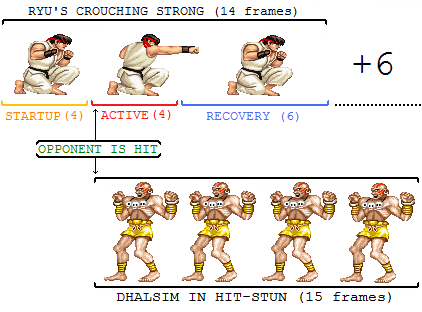 While the term comes from Ryu and Ken’s Shoryuken, not every DP looks like an uppercut. For a special move to be a DP, it follows these guidelines. No startup frames or invulnernable on startup. High recovery frames, easy to punish. All DP’s in Blazblue: Cross-Tag Battle flash red, so you can pick these out in the action easily. A DP is typically used to turn the tide of a battle back in your favor. When your opponent gets in close or tries to jump in, these moves are your most effective counter. It puts an end to their aggression and gives you a chance to become the aggressor. The extreme recovery frames force a player to carefully consider when to throw out a DP, however. If you guess wrong and your DP gets blocked or whiffs, you’ve got a one-way ticket to beatdown city. See what I- I mean, what Noel did here? Don’t do this. A dropped combo is when the attacker could have done more damage, but due to an input error didn't finish every potential attack. Recognizing a dropped combo is tricky; it requries slightly more intricate knowledge of the game and the character's movesets. The easiest place to notice these is in games where air combos are ubiquitous, like Guilty Gear, Cross Tag Battle, and DragonBall Fighter Z. Most air combos end with some sort of attack that knocks the defender back to the ground. If the defender gets a chance to hop out or walk away instead, there's a good chance the attacker blew it. It’s possible to follow up Yang’s Command Grab here, but I whiffed after several hits. We call that a dropped combo, folks. In contrast, here’s an example of a complete Yang Combo. Note how the final smash sends the opponent back to the ground, trapping them in the corner once more. This term is less common these days, but with Tekken 7 in the linup, it bears an entry. A just input, or sometimes "just frame," is any combo that requires an almost frame-perfect button press to continue. The timing is usually just as the previous hit lands, known as the impact frame. Landing one of these is devastating, but they're notoriously tricky to execute. Many fighting games have adopted the just input in spirit, but lightened up on the timing window significanty. As a result, this term has fallen out of favor - many of these inputs aren't so "just" anymore, and require far less skill to execute. Laura’s follow-up attack after this elbow slam is kind of like a just input, but the timing window is so generous no one refers to it as such. Games to watch for Just Inputs: Tekken 7 is the current king of Just Inputs. Almost every fighting game has a basic throw. By pressing throw, you toss your opponent. If your opponent also presses throw at the instant of a successful grab, however, they break the throw. Throws always beat blocks, and depending on the character or game, may even allow you to lead into a combo. In BlazBlue: Cross Tag Battle, throws often lead to combo opportunities. In Dragonball Fighter Z, the Dragon Rush is a multi-faceted tool you can use either mid-combo or as a throw. If done as the initial move, it leads directly into an air combo. In Street Fighter V, a throw is just a throw. Still useful in its own right, but not as visually impressive as the other two. A Command Throw, sometimes called a Command Grab, follows entirely different rules. Any throw done with a special input instead of the usual throw buttons is considered a Command Throw. Laura’s EX Command Throw lunges forward, perfect for surprising a complacent foe. You cannot break out of a Command Throw the same way as a throw. If you get grabbed by one of these, that's it. You're getting dunked in the dirt. Your best bet to avoid one is to neutral jump, or land an attack first. Unlike normal throws, some Command Grabs can even be used mid-combo. By neutral jumping here, Alex avoids my command throw and gets an opportunity to smash my face with his boots. Popular Command Grab Characters: In Street Fighter, watch for Zangief, R. Mika, Laura, Urien, and Abigail. In DragonBall Fighter Z, Android 16 has aerial dunks, and Cell has a nasty long range grab. Also, Trunks has a high damage command grab super to look out for. If someone’s legs “got blessed,” it means they weren’t blocking low. Just holding back isn’t enough to avoid all attacks. When you guard high, a low-hitting kick or punch will still connect. It’s important to vary your guard between standing and crouching accordingly to avoid getting opened up. Trunks’ sliding low kick will bless your legs all day, every day. In many fighting games, there’s a way to recover quickly. By pressing some sort of input upon landing, you can roll back to your feet. Fast-paced games like Guilty Gear, DragonBall Fighter Z, and BlazBlue: Cross Tag Battle even allow you do this in mid-air and flip out of a combo. A “Hard Knockdown” is any move that denies the defender an opportunity to easily ukemi. As the name implies, any move with hard knockdown sends the defender into the dirt. You might be wondering why this matters, since the defender seems to end up on the ground at the end of most combos anyway. The issue is varying up recovery methods is a key tool defenders have to throw off opponents. When the attacker knows when you’re getting up, they can time their attack as you get up for an optimal mix up opportunity. Hard Knockdowns are easy to pick out in DBFZ - Just look for the guy sliding across the floor! Once a character is in this state, you can actually continue the combo with supers. Not every super applies a hard knockdown at the end though, so burning meter may not always be the best choice if you want to go for a mix up. If you're curious what a mix up is, good news. Move on to the next category. Games to watch for Hard Knockdown: All of them really, but they are essential in DragonBall Fighter Z. If you’re putting your opponent in a position where they have to guess to avoid damage, congratulations, you’ve mixed ‘em up. This happens frequently after a hard knockdown. The attacker is going to lead in with one of the following options. In the above example, Ken's kick knocks Cody to the ground. Cody now had to guess which of these options Ken would lead in with next. He guessed he'd need to block, guessed wrong, and got tossed across the stage. If you go for the block and the attacker throws, you lose. If you block high and the attacker goes low, you lose. And if you block low and he goes for the overhead, you lose again. The flip side is if you guess right, it's your chance to turn the match around. As a general rule, be the one doing the mix up, not having the mix up done to you. If you find yourself in many mix up situations, you're losing. A Cross-Up is any attack that hits your opponent in the back. In order to block a Cross-Up, your opponent must begin blocking in the other direction before the hit lands. These are typically done by angling your jump to land behind your opponent, just barely, while throwing out a normal air attack. If done correctly, your opponent can only avoid damage by holding the opposite direction before your attack connects. Cross-Ups have been around since Street Fighter II as a programming exploit. Street Fighter V finally made them official with a UI element to let you know when you got crossed up. Not every Cross-Up is a jump like the example above. Some characters now have them as basic moves in their repertoire, such as Dragonball's Piccolo. Piccolo is the Cross-Up King. 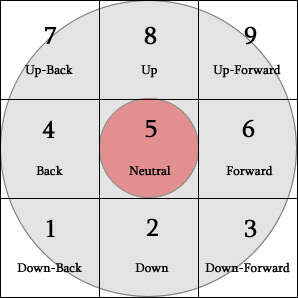 Neutral refers to when both players are at equal frame advantage. This is perhaps the hardest concept on the list to grasp, but I’ll do my best to explain it. As a general rule, fighting games tend to favor the attacker. If the attacker is throwing out the right moves in succession, they will have "frame advantage," meaning they'll be able to throw out another attack before the defender. The only way to come out on top as the defender is to do something to avoid a direct clash, such as call in an assist, guess a mix up right, perform a timely grab, or jump out of range. If you hear a commentator refer to someone’s “neutral game” (sometimes shorthanded to "the neut"), they’re talking about how they perform when the slate is clean. No one has an advantage, and each player is looking for an opening. Typically once hits start landing frame advantage will favor one player or another, but there are ways the slate gets reset mid-match. In DragonBall Fighter Z, a reset happens after each character is K.O’ed and a new combatant enters. Each time you see this screen, the players are now in neutral. When a player restarts the console out of frustration. A reset is when the attacker ends their combo to set-up a mix up opportunity. They are attempting to "reset" their combo and start a new one, but the cost is their opponent now has a chance to guess the mix-up and come out on top. Some commentators will use the term “neutral” to also refer to a neutral jump. As the name implies, this is when a character jumps with no directional input. They go straight up and back down. It may seem pointless, but when timed correctly it opens the door to ruthless punishes. This famous EVO moment, brought to you by the neutral jump. Commentators typically differentiate between "neutral" and "neutral jump," but if they just say "neutral", context is your friend. If no one is in the air, they're probably referring to the previous usage. An overhead attack is any move that breaks crouching block. The majority of new players will stay in crouching block to avoid getting caught in the legs, so abusing overheads is an easy way to win. If you’ve ever wondered why so many players seem to jump in first, it’s because aerial attacks hit overhead. By jumping in on Cody here, I open him up for an easy combo. Overheads have long, obvious startup frames so your opponent has a chance to stand before being tagged. Since this jump in is an overhead, Ryu had to stand to block it. By not returning to crouch afterwards, he got swept. 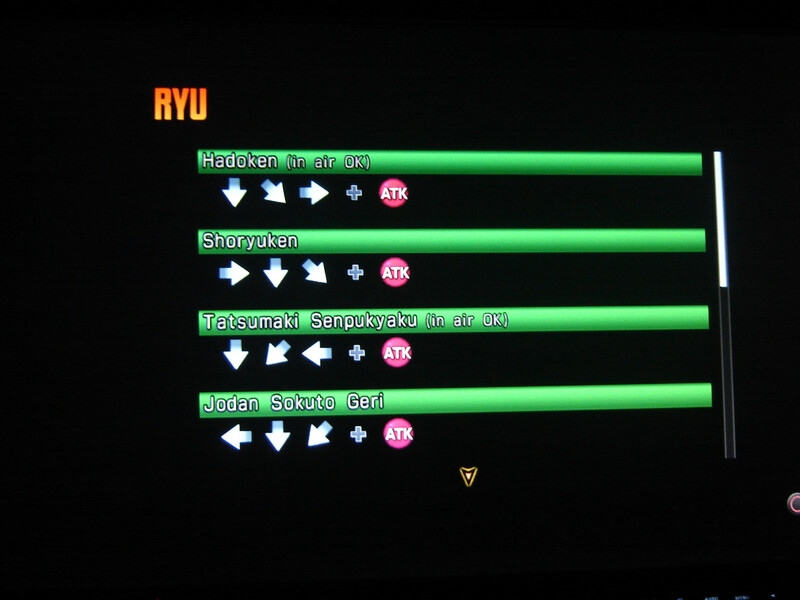 BlazBlue: Cross Tag Battle displays red exclamation marks to indicate an overhead hit, a useful visual to tell players they need to vary their guard next time the same attack comes. Typical Overhead Indicators: If a character does seemingly pointless things that extend their startup animations, such as raise their leg super high or a little hop before attacking, it's probably an overhead. A “burst” is any technique that breaks a combo, thus saving the defender from additional damage. There’s a significant cost to a burst technique - most of the time, it can only be performed a handful of times per game. The only exception is Killer Instinct, where breaking an opponent's combo is a repeatable, universal mechanic. But Killer Instinct isn't at EVO, so forget it. In Cross Tag Battle, bursting calls in your ally to save you at the cost of a full assist gauge. By bursting here, Hakama not only saved his ally from additional pummeling, but opened me up for chance to turn things around too. Each term above is unique to a respective game, but all three serve a similar purpose. Once activated, your character moves faster, recovers health, hits harder, and if used in the middle of combo, extends it beyond normal limits. The catch is you can only do this once per match, so choosing when to execute it is key. Sparking is often responsible for the incredible comebacks you see in Dragonball matches. There are a few slight differences on how these systems operate between games. In Dragonball Fighter Z and Marvel Vs. Capcom, the effect becomes stronger based on how many allies you've lost. If you're down to your last character they'll be under the effect for almost a full minute, whereas an early use with all allies alive will only last a few seconds. In BlazBlue: Cross Tag Battle, the Resonance Blaze's strength is dependent on how much you used your ally before they died. Games to watch for Bursts: Guilty Gear XRD, BlazBlue: Cross Tag Battle. Games to watch for Sparking or Sparking-esque functions: Marvel Vs. Capcom 3, Marvel Vs. Capcom Infinite (Which aren't going to be at EVO so I don't know why I'm listing them here), DragonBall Fighter Z. "O.D." is Overdose. You may have heard the acronym O.P. thrown around in the past for "Overpowered," but these days it's all about O.D. If you hear a commentator say someone's Bardock is O.D., It means they are incredible with Bardock. If they say Ruby's 5M is O.D., it means Ruby's neutral medium attack is exceptionally good. (If I lost you at 5M, don't worry. We'll come back to that later). This one comes straight from commentator Chris Matrix. I wasn't going to include this originally but I hear others adopting it, so now it's going on the list. If someone’s in “Alcatraz,” they’re stuck blockin' in a corner. The attacking player’s assault is unrelenting and the defender can’t find a way out. If you find yourself in Alcatraz, you done goofed. Do whatever it takes to get out of that corner. In DragonBall Fighter Z, the universal vanish technique will bust you out of Alcatraz. These terms tie into the idea of frame advantage we discussed earlier. If an attack is “safe” it means it’s “plus on block”. In other words, if your opponent blocks the attack, your recovery frames will have ended by the time their blockstun ends. If your opponent throws out an attack afterwards, you’ll either be able to either land the first hit or block their next blow yourself. Likewise, an “unsafe” attack leaves you open on block and put your opponent in prime position to punish. ...While throwing out DP’s left and right is not advisable and highly unsafe. A simple one. An Air to Air is any exchange where the defender jumps to counter the opponent's aerial attempts. DP's are a more common tool for halting aerials, but if you Air to Air to stuff an opponent's move, it's much easier to follow up with additional attacks than a DP. If two players jump at each other, it's probably an Air to Air. Footsies is when two players are trying to find an opening from midrange. This is a common sight in Street Fighter V.
You can probably see where footsies gets its name, huh? Crouching kicks have a long range, so players will try to catch one another with sweeps and pokes. At the midrange distance it’s hard for most characters to convert a poke into a full combo, but a successful sweep could put your opponent in hard knockdown. Then you can close in and mix ‘em up! If that last series of words made sense now, you’re ready to watch EVO. Akuma tried to end this game of footsies with a dive kick, but Laura was ready for it. Respect the footsies in SFV, folks. Games to watch for footsies: Street Fighter V is where footsies thrive. You may seem some foot posturing in Tekken 7 as well. Games not to watch for footsies: DragonBall Fighter Z has so many tools to close distance there's almost no use in a footsies game. When everyone can zip across the screen at full speed or teleport directly behind your opponent, the spacing game gets much more creative than shin kicks. There’s been debate in the fighting game community over the past, uh, forever about the best way to notate moves. Ryu’s hadouken is quarter-circle-forward and punch, or qcf p.
...Or using a numerical value to describe the joystick’s position, as pictured below. Currently, the numerical value has won the day. You’ll hear much talk about “5C” or “6B.” You could be forgiven for thinking the commentators are discussing side characters in Nier: Automata, but no. These terms describe the direction held and button pressed. In Dragonball Fighter Z you’ll hear “2H,” or down-heavy, often. 2H is a universal punish for super dashes and aerial attacks. Timing one correctly completely changes the match. Fighting Games are notoriously complex; I'm still learning new concepts myself everyday. Still, I hope this has been enough to help newcomers on the scene follow along with the action in August. With Fighting Games becoming more accessible every day, it only seems right we make a better effort to explain terms and demistify this genre. For a send-off, I've embedded perhaps the most famous match in Fighting Game history. This is the full set between Diago and Justin Wong at EVO 2004. I'm hoping if you watch this now, you'll have a new appreciation for all the techniques these two use. Street Fighter: Third Strike had a unique parry mechanic, which involved just-inputting towards your opponent during the impact frame. Doing this during a few attacks is impressive - parrying an entire super is Godlike.